Local 76 regrets to announce the Line of Duty Death of Lt. Kevin Hough on <?xml:namespace prefix = st1 ns = "urn:schemas-microsoft-com:office:smarttags" />November 30th, 2006 after a lengthy battle with lung cancer. 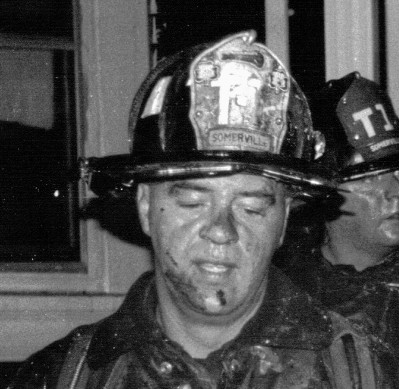 Lt. Hough was a 33 year veteran of the Somerville Fire Department. Photos provided by Kristin Powers, Capt. Bill Hallinan and Firefighter Earl Johnson III. IAFF General President Harold Schaitberger told the thousands who had gathered at the memorial, "It is up to us  for those whose names are now on that wall  to keep the meaning and value of their lives alive. We must make sure that they did not die in vain. We must use their loss to prevent other deaths from occurring." Local 76 President Jay Colbert holds the IAFF flag which was presented to the Hough family. Local 76 President Jay Colbert presents the IAFF flag to Lt. Kevin Hough's son Sean. Lt. Kevin John Hough's name was added to the black granite walls at the Memorial.